Microsoft used automatic updates to deploy security patches to your PC. The security patches were an essential way of helping to protect your PC against malicious activity from hackers, as well as protection from exploitive coding. 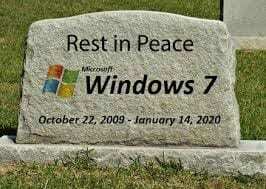 As a result, technical support from Microsoft for Windows 7 will no longer be available. This includes free security updates and bug fixes for the Operating System still used by many people. However, this could eventually leave Users more susceptible to malware attacks. Current Windows 7 PCs will still function, but as Microsoft is no longer releasing security patches for Windows 7 and with every passing day your PC becomes more and more vulnerable to malicious activity from hackers. Time is money. Windows 10 devices are up to 35% more time efficient than windows 7 PCs that are 4+ years old. So, say goodbye to Windows 7 as support will end on 14th January 2020 and hello to Windows 10. Keeping old devices may seem easier, but they could cost your business time and money as well as putting you at risk from cyberattacks. Also, batteries in new Windows 10 devices last up to 3 x longer that those in older PC’s. The move to Windows 10 will bring a variety of benefits and improvements. Migration from Windows 7 will provide Users with many key benefits. Users will notice instantly the speed of Windows 10 compared with Windows 7. Windows 10 streamlines the overall start up experience and is a fast, overall experience. Windows 10 brings improvements in functionality and usability. Windows 10 returns to the popular Windows start button. In a smartphone and tablet driven society such a major improvement is touch screen functionality. Windows 10 allows Users to continue this experience on their desktops and/or laptops. The ‘My People’ feature allows you to pin business contacts to the Windows 10 task-bar as shortcut icons. The ‘Unified Update Platform (UUP)’ a technology feature finds new changes to Windows 10 that your PC needs and only downloads specific updates. You PC will no longer have to download a larger package. Snapshots of the Windows applications used can be viewed in the ‘Timeline’ feature. You can select a snapshot to continue working on something you have worked on by clicking the Task View icon on the task-bar. Users on Windows 7 will receive immediate benefits following a transition to Windows 10 supplying increased speed, usability, and security. Effectively Windows 10 should be the ‘last’ windows according to Microsoft. There should be no need to upgrade to a new Operating System. Incremental updates will happen behind the scenes without any major upheaval. Windows 10 may look completely different in a few years’ time, but it will be ‘morphed’ in the background with no costly, difficult upgrades. This is more than a one-time upgrade: once a Windows device is upgraded to Windows 10, we will continue to keep it current for the supported lifetime of the device, at no additional charge. With Windows 10, the experience will evolve and get even better over time. We’ll deliver new features when they’re ready, not waiting for the next major release. We think of Windows as a Service – in fact, one could reasonably think of Windows in the next couple of years as one of the largest Internet services on the planet.